March 13th – 15th at the DCU (Convention Center) in Worcester, Mass. present it at the box office at the show. 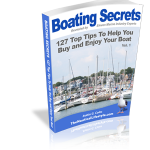 Also, get your copy of our free report (no registration required) “How To Work A Boat Show To Your Advantage“. Photo Contest – March 8 – April 12, 2009. Do you have a favorite photo of your boat lying around somewhere, hanging on a wall or in your office? If so, submit it and show it off! Your opportunity to meet others in the boating industry and build relationships. Your source for information through live interviews, forums, blogs, web links, articles, and much more.